transport your guests to the land of Luaus with our Luau theme tableware kits in basic, deluxe and ultimate kits that serve 8 guests each and are created to meet your budget needs. Our Luau theme tableware transport guests to a tropical Hawaiian Island adventure. Buy our budget minded luau theme tableware kits servicing service 8 quests with additional table decorations. Hawaiian party table settings with our Luau theme tableware, tropical table decorations, luau napkins, Hibiscus Raffia Table skirts and luau centerpieces will impress your guests. Our luau party tableware come in a variety of luau theme kits for most budgets. The larger the kit the more additional decorations. Do not forget to add luau theme confetti to your table top. 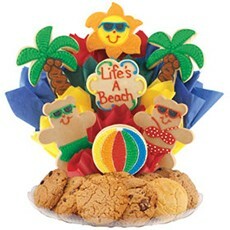 This bright and cheerful cookie bouquet is a fun vacation thank you gift, summer birthday gift, or pick me up gift. This item is priced as a 7 cookie. Tabletop Tiki Hut this 55 inches high x 56 inches wide x 22 inches deep hut is perfect for topping off your decorations. The metal framed tiki hut bar top comes with artificial thatching, hibiscus flowers, decorative garland, and a rubber base on the bottom of each pole to protect your table. Table decorations not included. Hibiscus Table Skirt Brightly-colored, polyester hibiscus flowers adorn the top of this 9 foot long nylon table skirt, for a true tropical touch. Not intended for outdoor use. The Real Coconut Cups are made from a real coconut and come complete with bendable straw and tropical flower. Each coconut cup is approximately 5 inches tall but may vary in size and shape. These fun coconut cups can be purchased individually or in packages of 12.